With so many products claiming to help to alleviate bloating, here’s our tried and tested list of 5 natural remedies that really work. Involved in the digestion of the foods we eat and maintaining the health of the digestive system, addressing the balance of the gut flora is fundamental when complaints like bloating are persistent. For more on the gut flora and how bacterial fermentation can cause discomfort, you can read What is bloating? 'One week flat' is a specifically formulated combination of probiotic strains and prebiotic fibre used to help manage symptoms associated with dysbiosis, over-eating, food intolerances, gas, constipation or PMS. Each box contains a one week course of pre and probiotics (one sachet per day), designed to help correct the gut flora imbalance that promotes fermentation, bloating and altered bowel habits. The bacterial strains in 'One week flat' produce enzymes which help break down starch and lactose molecules so this product is particuarly useful with food intolerance issues. Great quality, robust probiotic strains proven to reach the intestines where they’re needed without damage from gastric acidity or biliary salts. A sophisticated freeze drying process (lyophilisation) means there’s no need to store this product in the refrigerator unlike some other probiotics. Guaranteed therapeutic dose of 5 billion live micro-organisms per sachet. Probiotics may also help to support a healthy immune system, reduce allergies, promote detoxification, improve skin health, boost energy levels and enhance overall wellbeing. Read more about probiotic research here. Getting the powder to completely dissolve can take a little time and some getting used to. Take one sachet dissolved in liquid or added to cold food daily for seven days. For ongoing maintenance take another seven-day course each month. Completely safe for ongoing use throughout the month if preferred. Chances are you’re familiar with the benefits of Aloe vera gel when used topically for skin problems like sunburn, eczema and acne. What you might not realise is drinking Aloe vera gel can be just as soothing for an upset digestive system. A rich source of nutrients and enzymes, regularly drinking cooling Aloe vera gel can help to clear inflammatory heat, regenerate the gastrointestinal lining, balance digestive juices and gently cleanse the liver. Pukka's premium Aloe Vera Juice is particularly beneficial for those whose bloating or indigestion is associated with leaky gut, hyperacidity, gastritis, ulcers or IBD. For more about the benefits of healing the gut read Leaky gut and bloating. Made from great quality, organic, cold processed and unfiltered inner leaf Aloe vera gel. No outer leaf rind means there’s no bitter taste and no anthraquinone glycosides (strong laxative compounds found in Aloe leaf juice). More than 1000mg Aloe vera polysaccharides (natural compounds with an affinity for regenerating the skin, mucus membranes and other tissues) per liter. Over 5000mg of Aloe Vera solids (total active compounds in the inner gel) per litre. Aloe vera may also help to boost the immune system, regulate blood sugar and lipid levels, encourage detoxification, maintain youthful looks and tonify the female reproductive cycle. Bottled in recyclable glass - no plastic leaching harmful chemicals into the juice. No synthetic nasties using only 0.1% naturally derived citric acid from tapioca as a preservative. Adults take 10-100mls per day on an empty stomach. For a cleansing and nourishing start to the day drink upon rising, then throughout the day as required (i.e. before meals to help avoid bloating and indigestion). 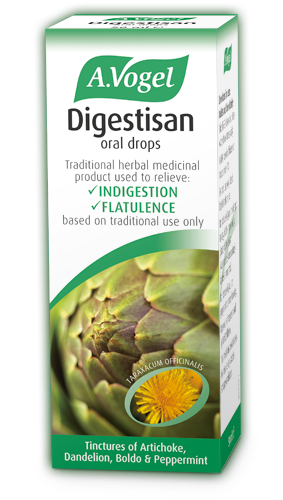 Digestisan is a licensed herbal remedy containing liquid extracts or tinctures of freshly harvested herbs with an affinity for calming the digestive system and helping to ease indigestion, bloating, flatulence or a feeling of fullness. Based on long history of traditional use, Digestisan is particularly handy when occasional indigestion, bloating or nausea is bought on by overindulgence. Mentha piperita (Fresh Peppermint herb) – 28mg (ethanol 65% V/V). Great quality, organic herbs cultivated in pristine conditions in Switzerland. Pleasant tasting, easy to take formula. Can be added to other herbal teas (like peppermint, chamomile or meadowsweet for example) for added effect. This combination of carminative, hepatic and cholagogue herbs may also help with intestinal cramps, flatulence, altered bowel habits, detoxification, cholesterol problems and irritability. Minor side-effects (allergic reactions, stomach ache, cramps, hyperacidity or reflux) may occur temporarily in some people. Peppermint may worsen heartburn or acid reflux. Artichoke should be avoided by those with biliary or liver disorders. Does contain ethanol (although only in very small quantities). Add 15 - 20 drops to a little warm water and take as required for indigestion and bloating. To help prevent indigestion and bloating take 15 - 20 drops in water before meals up to three time daily. The super absorbent property of activated charcoal is used medicinally and industrially to soak up and remove unwanted or harmful substances - as an antidote for poisoning for example. With a lattice like structure that has enormous surface area, activated charcoal can help to absorb the excess gas within the intestines that contributes to abdominal bloating. Bragg's originals Charcoal capsules are particularly useful for fast acting symptomatic relief of bloating, abdominal distention, burping and wind. Read flatulence and bloating for more about wind, and Getting rid of bloating for more on activated charcoal. The only UK company licensed to produce medicinal grade charcoal products. Highly refined and purified charcoal made from Coconut shell rather than wood or bone. 1g activated charcoal may have a surface area of over 1000 square meters. Fast acting symptomatic bloating relief. May also help with intestinal disorders, halitosis, nausea, heartburn, detoxification and altered bowel habits. May interfere with the absorption of medications or supplements so discuss using activated charcoal with the prescribing practitioner. Take 2 - 4 capsules after meals 3 times a day or as required. May be taken during pregnancy and lactation. Where bloating occurs alongside burping and a prolonged sense a fullness after eating, an insufficient supply of the acid and enzymes required for effective digestion is often involved. Multiple factors including ageing, stress and inflammation, can decrease the production of stomach acid and digestive enzymes. Without enough of these, poorly digested food can become a source irritation, fermentation or putrefaction. Topping up your levels with a good digestive enzyme formula like Nutrigest can help to avoid the symptoms of incomplete digestion. Check out Daniel's stomach acid for more information. Broad spectrum formula for supporting digestion in the stomach and small intestine. Hydrochloric acid begins the process of protein digestion, stimulates the endogenous release of pancreatic enzymes and maintains a low pH in the stomach. A mixture of pancreatic enzymes helps the breakdown proteins (by protease) fats (by lipase) and carbohydrates (by amylase). Papain and Bromelain are potent proteolytic enzymes found in paw paw and pineapple fruit, that help digest proteins. Ox bile helps emulsify and improve the absorption of fat. May also help with appetite problems, intestinal disorders, halitosis, infections, systemic inflammation, weight problems, allergies, detoxification, fatigue and even headaches. Not suitable for vegetarians or vegans. Vegetarian digestive enzyme formulas are available from Nutri. Excessive use may interfere with the body’s ability to produce digestive juices naturally. Discuss ongoing use with a practitioner. Take 1 tablet at the beginning of meals (larger more difficult to digest meals rather than smaller easier to digest snacks) up to three times daily. Tablet must be swallowed whole. So there it is, the Bloating Tips list of 5 natural products that do really help to ease bloating. Try them out and see for yourself. Give our Natural remedies page a look for more natural approaches to managing symptoms. Brendan is a integrative naturopath, nutritionist and yoga teacher. He has completed training in Naturopathy, Nutrition, Herbal Medicine, Yoga, Iridology and Live Blood Analysis.